A Fantastic Pop! would like to celebrate one of the most transcendent and eternal forms of cinema, a genre almost as old as the medium itself, likely to follow us far into the future: the employee training video. Yes, we've all had to sit through a few of these enlightening mini-movies soon after signing our I-9 and W-2 forms. How else would we know how to avoid awkward, embarrassing and potentially harmful accusations of sexual harassment, avoid potential conflicts of interest, or safely operate a fry cooker? Thankfully, the hard-working writers, directors, performers and crew members who make these employee training videos diligently explain how to do our jobs while reducing the risk of life-threatening injury, costly lawsuits, and other negative consequences up to and including termination. Nowhere in the vast library of employee training videos has a company exceeded the levels of production, absurdity and (dare I say it?) artistry of the American fast-food chain, Wendy's. Doubt me? See for yourself. Turn up the volume, and prepare to experience the wonder and awe of Wendy's "Grills Skills" rap, a fine guide to proper fast-food burger preparation, and an excellent example of the early appropriation of hip-hop culture, part of the legacy of blaxploitation films from the 1970s and 80s. Enjoy. Did you know a metal spatula is an effective substitute for an electric guitar? The four-corner press. Know it. Live it. Be it. But where can I get the glittery version of the Wendy's green polo shirt? And why aren't those standard-issue? You can bet Dave Thomas would be able to tempt an entire legion of new employees with that kind of bling, ready to salt from the back to the front with the best of 'em. What's cooler than being cool? If you don't know, I'm not telling you. Don't forget to smile when your serve cold drinks. Words we would all do well to live by. And now we know that Wendy's iced tea is more ice than tea. Drink quickly, lest thy tea be as weak as thy flesh. Just throw the spoon away? That's not very eco-friendly, Ms. Wendy. A half inch from the top. I see a trend emerging. And if I had ever worked at Wendy's, I want to let you know that there would've been plenty of cracked cookies unfit for customers that I would have dutifully consumed so that their crumbly mess would not have offended the delicate tastes of our pampered guests. Perish the thought! Those seductive eyes when he blows the steam off the lid. I think I may be ovulating. And I don't even have ovaries. But still, if he poured my coffee to the line, I would have all of his babies. Somehow. Also, if you're ordering de-caf at Wendy's, I hope you get a freeze-dried packet of Sanka, because that's all you deserve. Now that you've watched all these videos, I hope they've kept you well-entertained. And we certainly hope you'd make a valued Wendy's employee. But if you're one of those chosen few who have the opportunity, the privilege to help produce an employee training video, I hope you even have one iota of the mojo that these folks at Wendy's headquarters had when they made these films. No, they never paid their employees a living wage. And I myself have questioned the contents of Wendy's chili, even as I am ladling spoonfuls into my mouth. Countless, piercing headaches have thundered through my skull from too many bites of those dastardly Frosties. But I'll be damned if Mr. Dave Thomas didn't bankroll the best employee training videos ever created. I tip my styrofoam lid at you, good sir. And in case you can't get enough employee training videos, enter the nightmarish hellscape of Blockbuster Video (but don't say I didn't warn you). Welcome to "A Fantastic Pop! ", American Fantastic's pop culture blog. I am also mirroring A Fantastic Pop on blogger so that more people can find out about the website, and so I can also follow other pop culture blogs. So if you like this blog and you're also on Blogger, please spread the word among your friends and invite them to check out the main site here. My goal is to write about examples of pop culture that I enjoy, that helps inspire me as an artist, or at least helps me enjoy my time as a human being. My name is John Beechem, and I am the Editor-in-Chief of American Fantastic. But enough of that, time to write about Chroma Squad! If you're a millenial like me, or even someone who was semi-conscious during the 1990's, you remember Saban's Mighty Morphin Power Rangers. For the uninitiated, MMPR was a live-action, costumed martial arts show about a group of American teens who teamed up to take on all kinds of cosmic threats, often in the form of strange monsters with weird outfits designed on a tight deadline but a decent budget. The show also had giant mechs, dinosaur themed weapons, hunky teens, and never took itself too seriously. After the action animation boom of the 80s and early 90s (G.I. Joe, Transformers, Teenage Mutant Ninja Turtles) MMPR was a live-action karate extravaganza that gave energy to the imaginations of all kinds of kids. Chroma Squad takes the basic concept of the Mighty Morphin Power Rangers and turns it into a squad-based tactical strategy game with a meta-narrative concept: instead of being in the literal roles of the fictional characters, the player plays the role of the actors themselves who've splintered from their universe's version of MMPR to create their own T.V. 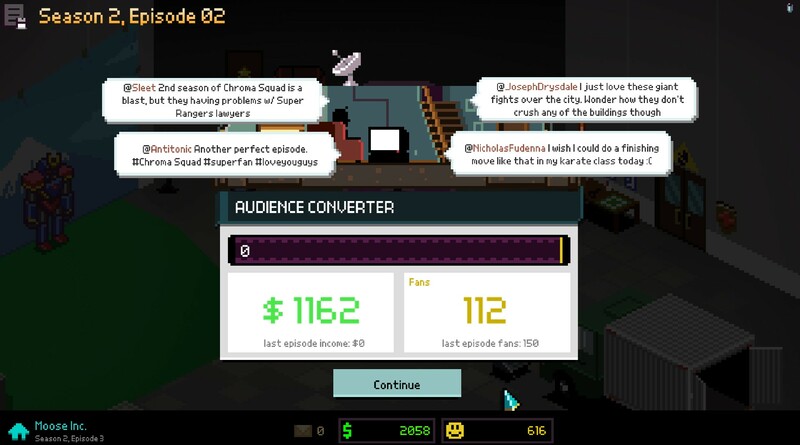 show, Chroma Squad. This is an excellent way to pay homage to Saban's T.V. show while also keeping the concept fresh for gamers today. Behold Studios does an excellent job of crafting a tight, challenging, but not too difficult squad based strategy game for fans of the show and tactics-strategy gamers alike. When MMPR was on the air, I didn't even like it. I was slightly too old for it, and felt the costumes were too cheesy and the action was on the wrong side of goofy. But now, I can look back and see it for the silliness it embodies, and Behold takes this concept and runs with it, balancing the eccentric concept of a live-action, kids sci-fi martial arts epic with the tight gameplay of a well-done tactics-strategy game. So let's get into nuts and bolts. How does Chroma Squad look and play? The game looks quite charming with colorful, pixelated graphics and neat little touches like a loading screen that looks like a staticy T.V. (they've even curved the corners as the game loads to recreate the look of a tube T.V. set on your flat-screen monitor). Animation is smooth, the tiles of movement and action are laid out in a way that's easy to understand, and the epic mech fights at the end of some stages have the same kind of of zoomed out look of the MMPR or Tojo (Godzilla) cityscape fights. Cut scenes are well done too, played out on the same isometric map as the missions themselves, but with comic book speech bubble dialogue. The music is enjoyable, and the sound is retro but effective. For fans of tactic-strategy games, you'll get what you'd expect. You can choose your difficulty, from easy to difficult. I chose average, and winning the missions (so far) has been fairly easy. Where the challenge comes in is fulfilling optional mission specific goals, such as clearing enemies in a certain number of rounds or defeating the boss with a finishing move. This keeps the gameplay challenging, and fulfilling these optional objectives is no hollow reward: increased experience and loot makes meeting these goals well worth the effort. The game doesn't have the deep complexity of Final Fantasy Tactics, but for an indie studio, that's understandable. And the game's remarkable charm and low price tag ($15) more than make up for this. As a busy adult who only has a few hours for gaming a week, this gives the game a pick-up and play feel, as individual missions usually don't drag on for more than a half hour. Aside from the tactics gameplay, players can spend as much time as they'd like between missions crafting items, deciding which skills they'd like their characters to use, purchasing improvements for their television studio, improving their mech, and equipping gear. The game is deeply customizable too: players can use the default crew, or create their own characters from scratch, going so far as to create original catch-phrases, show names, studio names, and other opportunities for originality. Players can choose the episodes they'd like to play next, and the choices involved as the game plays out offer multiple endings. And I can't say enough of this game's charm. The "tweets" you read from fans after each episode are a neat touch that make you feel engaged with these imaginary fans you're struggling so hard to earn. So if you're looking for an excellent tactics-strategy game that won't break the bank, or want to relive a little bit of your childhood, give Chroma Squad a try. It'll keep you well-entertained for a game-filled weekend, or stretch it out for a few weeks if you're strapped for time like I am. Behold Studios is an independent video game developer who funded their project through Kickstarter, so if you're a fan of independent media, that's another reason to give the game a try. Thanks for reading, and keep checking back for more updates from A Fantastic Pop! May the forces of good continue to triumph, as chromatic and pixelated as they care to be. Daft Punk’s Random Access Memories is the sound of a heart-broken robot mourning for their lost lover. It is the bounce and boogie coming from a dance party light years away; a well-oiled machine built from funk, disco, rock and electronica. Daft Punk’s most recent album is full of sounds that seem to be coming from the past, present and future. Daft Punk is a French electronic music duo best known for their high energy dance songs, excellent musical ability, and identity as robots. Random Access Memories continues Daft Punk’s legacy as dance pioneers, but collaborators including Nile Rogers (Chic) and Giorgio Moroder (song-writer for Donna Summer) provide a clear link to disco and a heavy influence from yesteryear. This is appropriate, since modern electronic music has inherited disco’s reverence of dance as one of the best forms of human expression, an end unto itself. This album is designed to make the listener get up and then get down. One distinguishing feature of Random Access Memories is the highs and lows that exist from song to song. For every tune about love and excitement, there is one about crushing isolation or yearning for another. Happily, the album’s positive energy blunts the edges of the sadder songs, and reminds the listener how fun Daft Punk can be. The album has a wonderful sense of variety. Soulful songs tinged with sadness exist alongside high tempo, exuberant jams that give a sense of shifting balance. The instrumentation also alternates between traditional rock guitars and drums to more of an electronic sound, but Daft Punk uses both methods to good effect. “Get Lucky”, the first single, represents the upbeat side of the album, a song about a young man’s not so hidden intentions as he parties until dawn with the object of his desire. It’s a very danceable song, and features vocals by Pharrell and the duo’s own roboticized voices. Fans of Daft Punk are likely to love it, as it represents a continuation of the style they’ve always been known for. The playful lyrics, the fun melody, the groovy beat, and sci-fi effects are all present. As futuristic as some of their instruments and outfits are, Daft Punk are also masters of the classics, including guitar, drum and bass. Their strings on the song “Motherboard” blend with the synthesizer so well one could imagine them performing in an 18th century French music hall with velvet coats and powdered wigs covering their robot heads. It is refreshing to hear electronic music that doesn’t solely consist of sounds coming from a computer. Daft Punk are experts of digital and analog, and their skills are on full showcase. The few flaws on the album are related to a near over-inclusion of collaborators. The song “Georgio by Moroder” features an extended interview excerpt that overshadows the music and lengthens an already long song. It’s good to listen to once, or perhaps as an extended cut, but embedding it into a song means the listener can’t easily skip over it, and will hear it over and over. Some collaborators also seem to eclipse Daft Punk themselves on certain tracks. “Touch”, for example, sounds more like Paul Williams featuring Daft Punk than Daft Punk featuring Paul Williams. His vocals, not Daft Punk’s instrumentals, are the most important aspect of the song. Luckily, as in “Get Lucky” featuring Pharrell, when the collaborations work, they work incredibly well, and are good enough to excuse the less stellar examples. 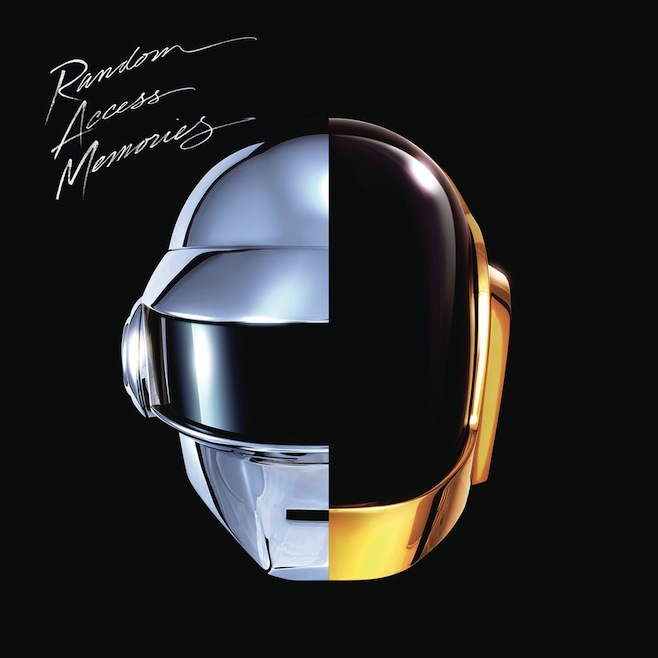 Random Access Memories is a well-balanced composition, and provides a welcome return for Daft Punk. It makes me excited for what the band still has yet to come. The final song on the album, “Contact” climbs to an enormous crescendo before finally bursting like a balloon filled with glitter, and I’m looking forward to seeing what happens in the aftermath.